A new study published in the Journal of the Academy of Nutrition and Dietetics suggests that students who have 20 minutes or less to eat during lunchtime rarely finish their lunches and may make unhealthier food decisions. The research team from Harvard T.H. 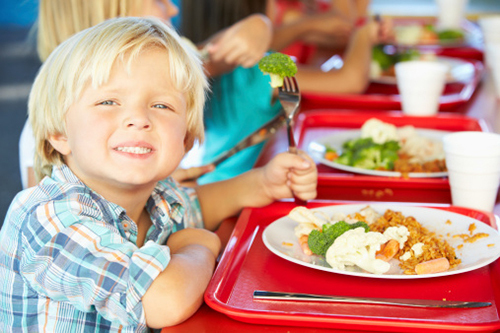 Chan School of Public Health in Boston, Massachusetts set out to investigate whether there was any association between the time children had for lunch, the food choices they made, and how much they consumed. Over 1,000 students from six elementary and middle schools took part in the study—all of whom had lunch periods between 20 and 30 minutes in length. Each student was from a low-income urban district school in Massachusetts. This is an important factor because most students that come from low-income families get almost half their daily nutrition from school meals. Researchers discovered that students who had less time to eat during lunch would start eating their entrées, vegetables, and milk, but would not finish them. Students only got through 13% of their entrées, 12% of their vegetables, and 10% of their milk. The team also found that when it came to picking a piece of fruit, students with little to no time made a selection 44% of the time, compared to 57% of students who had more time to eat. Vernon, J., “Could Longer School Lunch Periods Encourage Healthy Eating?” Medical News Today web site, September 11, 2015; http://www.medicalnewstoday.com/articles/299405.php. Rimm, E.B., et al., “Amount of time to eat lunch is associated with children’s selection and consumption of school meal entrée, fruits, vegetables, and milk,” Journal of the Academy of Nutrition and Dietetics September 11, 2015, doi: 10.1016/j.jand.2015.07.019.